This clip is new NOS Clip. 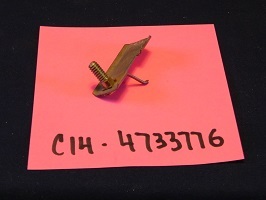 This clip is said to be for the 1958 Chevy Door Molding. As so many of these unique clips are, they are not being made today so are in very limited supply. In this case I am not sure of the complete application. To clarify, I am not sure if this clip would be found on the Bel Air, Biscayne or the Impala. I do know the GM part number is 4733776 contains this wording in the GM Parts Books. The flat plate portion of this clip is 1 7/16 in. long and both edges of the length have a small bend up making the flat section similar to a small channel. The one ear that would press against the inside of the molding is actually cut out of that flat plate. The screw is 1/2 in. long and found on the very end of the plate.